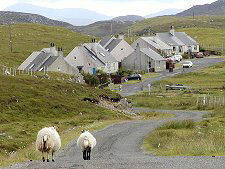 Great Bernera, or simply Bernera, proves how popular the policy of building fixed links to the smaller islands can be. At the start of the 1950s the 400 residents were so keen to bridge the 150m gap between Bernera and Lewis they threatened to build their own causeway by dynamiting the cliffs on either side. The authorities responded by building the bridge you see today, opened on 22 July 1953. A crowd of 4,000 people then walked across the new bridge to Bernera. The Stornoway Gazette reported: "On that day Bernera ceased to be an island and became part of Lewis. Or perhaps it would be more accurate to say Lewis ceased to be an island and became part of Bernera." Bernera measures nearly six miles from north to south by about three miles from east to west. 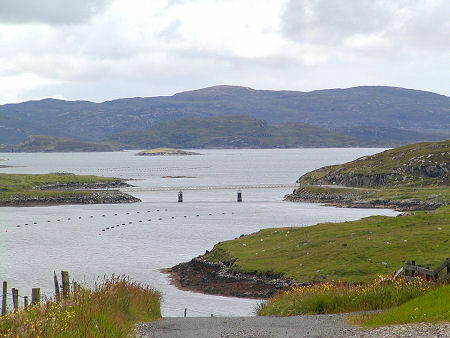 It is by far the largest of the large number of islands in Loch Roag, which bites deeply into Lewis's north west side. 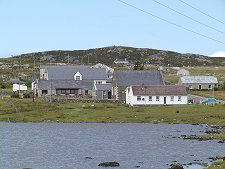 Bernera and the surrounding islands are owned by Count Robin de la Lanne Mirelees, also known as Prince of Coronata who is a resident of Great Bernera. 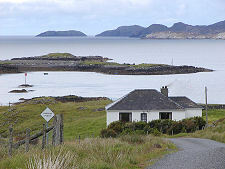 The centre of the island, geographically and in every other way, is at Breacleit. Here you find the school and church. 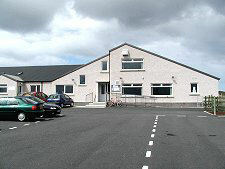 Here too is a shop and post office, and a doctor's surgery. 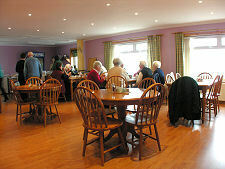 A striking new addition is the large sloping roofed community centre which contains a very good cafe. 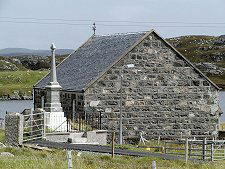 It is also home to the Bernera museum, which explores the island's fishing heritage and its wider history. 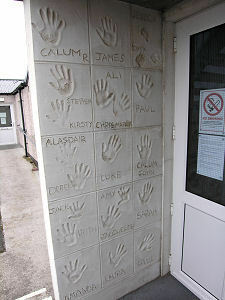 In the doorway are handprints left by the island's Millennium children. At the north end of Bernera is Bostadh, home to a number of beautiful beaches and some superb coastal scenery. Here too, are the excavated remains of an iron age village exposed in the dunes during a severe storm in 1993. 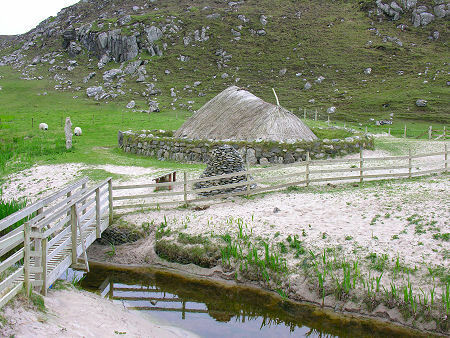 Five houses have been excavated at Bostadh, and a replica of one of them has been built to look and feel as much as possible as it would have done to the original residents of the village in the centuries after 500AD. En route to Bostadh you pass the distinctive cairn erected by the people of Bernera in 1992 to commemorate the participants in the Bernera riot of 1874. This was the first time that crofters had stood up for their rights and although one result was the trial of three of the the ringleaders, another was the eventual passing of the Crofters Act which gave security of tenure to crofters throughout Scotland. The cairn is built with stones from every croft on the island, and topped by coping stones from the houses of the three who stood trial. 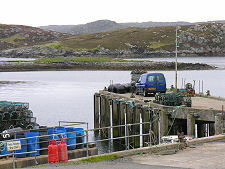 The east of Bernera is home to much of the island's fishing fleet. 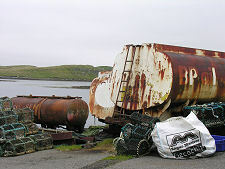 The island had been noted for its fishing as early as 1550, and in 1972 a processing plant was built at Kirkibost Pier. Fishermen on the island specialise in catching lobsters, some of which can grow to enormous size in the waters of Loch Roag. Despite it's truly magnificent setting, Kirkibost Pier is not the prettiest harbour in the Western Isles. And that's before you take account of the collection of old petrol tanker bodies on the quayside: heavily rusting and each steadily dripping something onto the harbourside and from there, presumably, into Loch Roag. Derelict vehicles are by no means a novel sight in the Western Isles: but this level of environmental disregard places Kirkibost Pier in a league of its own, not just in the Western Isles but in Scotland more widely.